Parenting: Month 8 | Team Alzen! This kid has been such a joy this month. She easily runs errands and goes on outings and charms people everywhere we go. 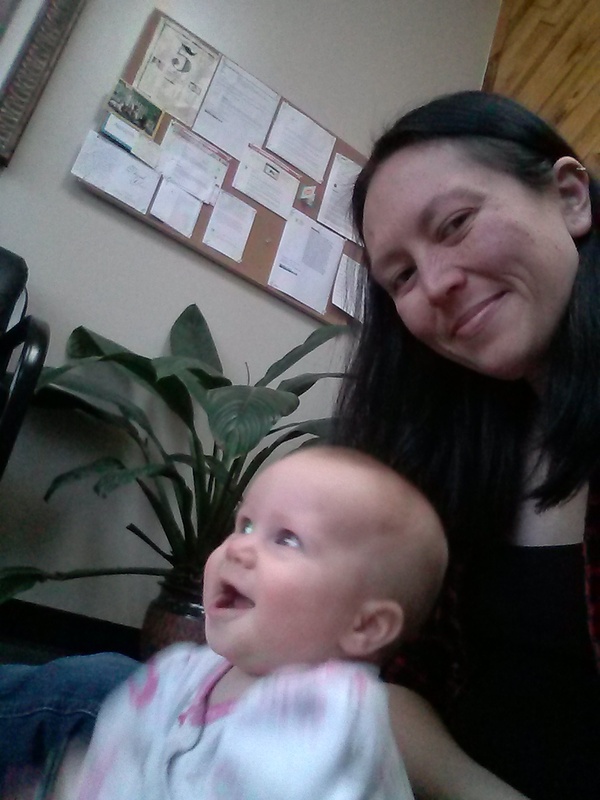 This picture is her hanging out on the floor of an oral surgeon’s office as we waited for a friend to have her wisdom teeth pulled out. The front office workers, nurses, and even the surgeon himself all came to talk to her as she was a great delight while we waited for over an hour. AB also has friends at the fabric store and in our church group, but she doesn’t like going to strangers anymore. Being her mom is a joy. This month has been a good one. We’re still figuring out routine, but we’re figuring it out nonetheless. I’ve created a work station that includes a nice big and safe play area for her to roll around in. Taking a shower is no longer a rare occasion, and the interactions with this Little Bug are priceless. I’m planning to start getting up at 5 to work for an hour or two before she gets up for the day. Since she isn’t totally regular on her schedule, I know this isn’t realistic every day, but even once or twice a week will be a big help. I’ve got several research projects running right now, so I need to do what’s needed to get good blocks of work in each day. This last month I was able to get away for 5 days for a work conference. It was a great experience. Saying goodbye was ok, and I didn’t really start to miss her until the 4th day. The most ridiculous part of the trip was shuttling bags of expressed breast milk to the concierge desk multiple times a day to be stored in the hotel kitchen’s freezer. Definitely not an experience that I thought would ever be a part of my life, but definitely worth it.